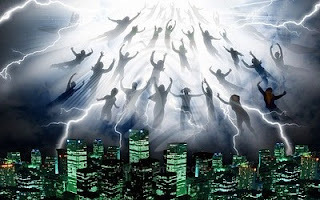 Introibo Ad Altare Dei: Getting Caught Up In "The Rapture"
Recently, a movie entitled Left Behind was brought to my attention. It was released in October of last year and starred Nicholas Cage in a remake of the movie from 2000 staring Kirk Cameron. All of the Left Behind movies are based on a series of novels released from 1995-2007 by Protestant authors Tim LaHaye and Jerry B. Jenkins. The novels are concerned with the Protestant heresy known as "the Rapture." The first movie, with Kirk Cameron (and its two sequels), is full of pre-trib theology, as were the books. Cameron, an evangelical Protestant himself, helped write the screen play with his friend and fellow sectarian Ray Comfort. (Although having the best of intentions, it is painful to hear Comfort debate with atheists. He makes believers look ridiculous, having once asserted that a banana was "proof of intelligent design" by God because of the way it fits the human hand. I wish I was joking, but I'm not.) The remake with Cage is so bad it was ridiculed by Christianity Today, calling it devoid of religious significance. "Consider: one of the characters proposes that the Rapture was caused by aliens, and the movie would be no different if this were true....In fact, most Christians within the world of the movie—whether the street-preacher lady at the airport or Rayford Steele’s [main character's] wife—are portrayed as insistent, crazy, delusional, or at the very least just really annoying. Steele’s wife’s conversion to Christianity is shown to have pushed her and her husband apart; we see that she’s decorated her house with crosses, throw-pillows that say “Pray” across the front, and encouraging posters.That is the deepest conception of Christianity that this movie has: posters, pillows, and crucifixes." (See http://www.christianitytoday.com/ct/2014/october-web-only/left-behind.html?paging=off). II Peter 1:20 states, "Understanding this first, that no prophecy of scripture is made by private interpretation." (Emphasis mine). Finally, in II Peter 3:16, "As also in all his epistles, speaking in them of these things; in which are certain things hard to be understood, which the unlearned and unstable wrest, as they do also the other scriptures, to their own destruction." This heresy has led to the "prosperity preachers," like Joel Osteen and others, who tell us Christ suffered and died for us so we can believe in Him, thereby getting to live in a mansion while driving a Rolls Royce. So if you hear about "the rapture," don't you believe it. Worry not about being "left behind." Rather, pray that you don't get led astray. "But he that shall persevere to the end, he shall be saved." Google "Left Behind or Led Astray: Paul Wilkinson's Vitriolic Outburst" [Sep. 10]...," "A Difficult Response to Paul Wilkinson [Nov. 26]," "Catholics Did NOT Invent the Rapture," "Margaret Macdonald's Rapture Chart," "Margaret Macdonald's Main Point," "Pretrib Rapture's Missing Lines," "Edward Irving is Unnerving," "Edward Irving Vs. John Darby," "John Darby Did NOT Invent the Rapture," "Pretrib Rapture Pride," "Thomas Ice (Bloopers)," "Walvoord Melts Ice," "Wily Jeffrey," "Grant Jeffrey's Apocalypse Debacle," "Pretrib Rapture Stealth," "Pretrib Hypocrisy," "Famous Rapture Watchers," and "Pretrib Rapture Dishonesty." Read somewhere where Kirk Cameron is being criticized by his fellow protestants because he has been defending what he believes to be the Catholic church.It would not surprise me to see him convert to the V2 sect and appear on "The Journey Home".